Located on Palomar St. near the intersection at Third Ave, this ACE Cash Express is a stand-alone building with its own set of parking spaces. Bus #712 of the Metro Transit System has a stop at Palomar St. and Third Ave., while Bus line #929 has a stop at Third Ave and Palomar St. Check SDMTS’ website for routes and destinations. This location is conveniently surrounded by eateries such as Gunco Ramen, El Dorado Authentic Mexican Food and Rojas & Sons. Click here for more Chula Vista Title Loan locations! Call our toll-free hotline and speak with one of our knowledgeable LoanMart specialists! Trusted by over 250,000 customers since 2002, title loans powered by LoanMart offer borrowers competitive rates and unbeatable benefits. 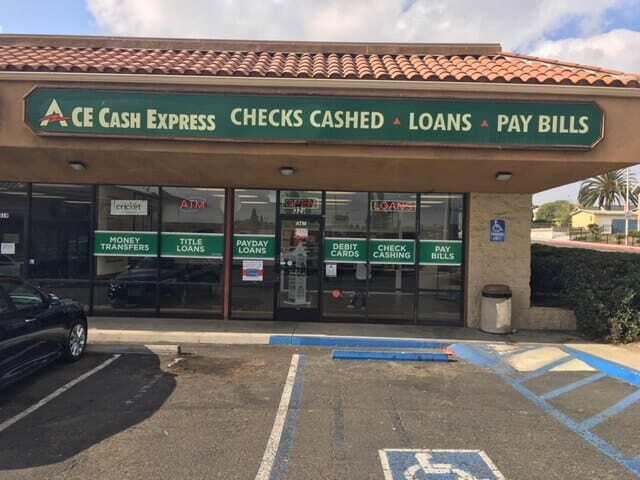 Located on Palomar Street near the intersection at Third Avenue, this ACE Cash Express location is a stand-alone building with plenty of parking spaces for customers. Bus #712 of the Metro Transit System has a stop at Palomar Street and Third Avenue, while Bus line #929 has a stop at Third Ave and Palomar Street. Check SDMTS’ website for routes and destinations. This ACE Cash Express location is conveniently surrounded by eateries such as Gunco Ramen, El Dorado Authentic Mexican Food, and Rojas & Sons. Obtain an Auto Title Loan Powered by LoanMart in Harbor Side! In today’s unpredictable economic climate, even the most responsible individuals may experience financial instability. An unanticipated expense such as a medical bill may make the burden significantly heavier. If you’re a Harbor Side resident in need of emergency funds sooner rather than later, consider an auto title loan powered by LoanMart. Traditional lenders like banks and credit unions often put a heavy emphasis on a customer’s credit score when determining eligibility. But by defining a person by a single set of numbers, an inaccurate portrayal is painted. Some of these include the qualifying vehicle’s equity, the individual’s ability to make regular monthly payments, and more. Why Choose Auto Title Loans Powered by LoanMart in Harbor Side? If you own the title to a qualifying vehicle and possess a government-issued photo I.D., you’re already ready to apply! In some cases, an inquirer will be asked to submit extra documents such as a utility bill or pay stubs to verify information. Once approved, an agent will talk to you about obtaining your money at ACE Cash Express!